Sometimes, hobby gamers tend to get so focused on the 80 dollar releases full of plastic monsters and illustrated game maps that we forget that lots of normal people play games, too. Only they don't play games with plastic monsters and illustrated maps, they play games you can buy at Target and that have a 3X5 card for a rulebook. And the crazy thing, the improbable truth, is that they actually have fun with those games. 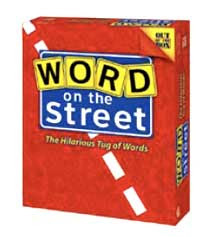 And when I play Word on the Street, I have fun, too. That just seems wrong, because there's no area control, worker placement, or resource management. There's no long-term strategy, careful planning, or brilliant tactical maneuvering. You just think of words, then you spell them. Everyone playing splits up into two teams. Then you whip out a card that says something like, 'A lake,' and one team has about 30 seconds to come up with the name of a lake. They spell the word, and every time they get to a consonant, the letter tile slides one space closer to their side. If they can pull a letter off the board, they get to claim it, and you can't move it any more. Claim eight letters, and your team wins, and can then gloat and throw popcorn at the losers. For those of us who spend our weekends sequestered inside shuttered buildings playing tactical recreations of obscure wars for alien planets, the idea of spending an hour playing a game that we could have bought at Wal-Mart might seem downright insane, unless we're playing with our cousins who just bought Scrabble and think they're game nerds now (quick aside - owning Scrabble does not make you a nerd. It makes you just like the other billion people who own Scrabble. Owning Claustrophobia or all the Dominion expansions, on the other hand, is a completely different story). And yet this simple, bland-looking game with a cliche of a name and a board composed largely of gray squares is so much fun that you might wind up blowing an entire evening on it. You don't even have to be a language geek (though it helps - my family loves to play around with vocabulary, so we tend to come up with some pretty wild words. I want to believe that the average family, when presented with a card that says, 'animal sound,' would not come up with 'onomatopoeia'). Word on the Street starts off deceptively easy. After the first few rounds, we were ready to ditch the sand timer, because nobody was having any trouble at all. The words flow like wine, and tiles are moving all over the place. Everyone is laughing and saying how much fun they're having. The mood is light and all is well. And then a couple letters get captured. If someone already has the 't' and the 'l', 'flatulate' only moves one letter. You need a different fart joke, and you need it fast. And then you sit there looking at each other, stumped and trying like mad to come up with a word for 'something that scratches' that will use the letters 'p' and 'g' before the timer runs out. And then all you can come up with is 'wool', but the 'w' is already gone, so you just pull the 'l', and then the other team starts laughing and goes, 'how about Grandpa!' This is especially embarrassing if Grandpa is on your team. By the end of the game, only a tiny fistful of letters is left, and the game is just a constant tug of war to pull that 'k' off the opponent's back line and see if you can find a way to move the 'v' into your own side. As the game nears its finish, you could cut the tension with a knife. 'Veal!' shouts the other team, to which you answer 'Kansas!' Then comes the breaking point - 'Kick!' The 'k' slides twice now, right off the board, and the other team starts their victory dance, which probably includes some kicking, just to rub it in. It's amazing to me that with an office overflowing with some of the finest hobby games created in the last several decades, my family is excited to play a game we got on sale at Barnes & Noble. It's not pretty, it's not complicated, and we read through the rules in three minutes. We're gamers in my house, big-time dice-and-cardboard geeks, and yet we'll throw it all over for a crazy word game, because Word on the Street is just that much fun. It's not the least bit surprising that Noble Knight Games does not carry Word on the Street. Try Wal-Mart. It is available online from Amazon (so you can post an affiliate link ;) )! Dead on and poignant review. When I explain my geek attraction to hobby gaming to others who have fun with mere Wal-Mart games, I hope I don't sound like a stuck up jerk. And don't look now, but these thoughtful reviews are better than your fart jokes...! Quiddler and Word Thief are big hits in my house. I'd put them in the same category as Word on the Street, which also sounds like a lot of fun. Of course, games like this are a great opportunity to show off your massive vocabulary, so one can still be a geek about it. Pity the poor friend who came over for an innocent game but neglected to read extensively in classic literature or history first.